Sorry for the radio silence! Between Ravencon, a lung/sinus infection and a flooded basement I’ve been running behind on stuff. But I did have time to do a little extra special art for this week’s spotlight on Lynald Winguard, the co-star of Madame Bluestocking’s Pennyhorrid. I loved it so much I printed it off and hung it on my wall. It stayed on my walls through most of college, but sadly, he had no story. Lynald had no home, no personality, no goals. It was only later when I was thinking of writing a weekly serial that this dashing pilot came back into my head. He was a pilot but I wanted to make this a steampunk fantasy, so rather than a plane, I decided to give him a dragon in a world of steam dragon machines. 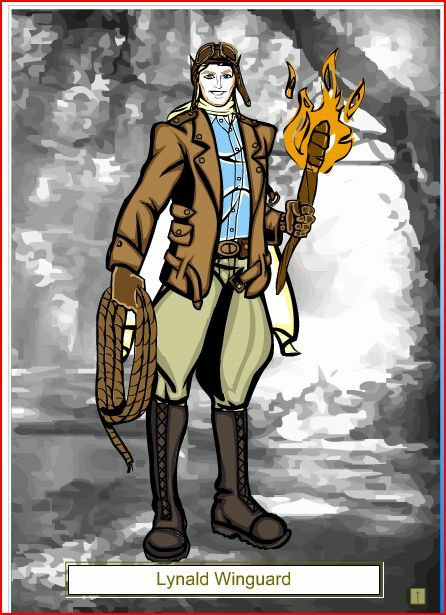 I then paired him with a conniving, selfish, cowardly Orchid Hunter from another story idea, changed him slightly into a neurotic wizard and there was my team for Madame Bluestocking’s Pennyhorrid. I stuck him in Tereand, because it was already there, I just set the clock forward 200 years. A lot happened to Linus’ world in that time, chiefly almost all the magic and Elves have died out. I don’t want to go into much detail on that. It depresses me. But anyway here’s some Lynald facts, including (as requested by fans) stuff his own mother doesn’t know. WHAT WERE HIS EARLY YEARS LIKE? Lynald is the only son of Sylvestir and Gwynriell, two first cousins who isolated themselves from the rest of their clan, and pretty much the world too. The Winguards decided that the ultimate way to save the dying race of Elves was to revive the old traditions of the Elves of centuries ago. They lived like hermits, communicated only with other Elves of sufficient lineage, and tried to raise their poor son as a golden epitome of the Elven Ideal. Lynald was forced to learn fencing, bowmanry, ancient traditions and customs, and the dead Elven tongue. He failed abysmally at all of these.Lynald had no head for academics, languages, and his parents’ constant hectoring. He resolved to run away at the first chance he got. It was only when he convinced his father to let him attend university to learn more about Elven history that he got his chance. He stayed at University for all of eight weeks before doing a runner and joining a touring opera company. He spent years becoming a classically trained tenor, countertenor and actor until his company toured an Imperial Air Force base and saw a fleet of dragons flying overhead. Enamoured with the creatures he parted ways with the opera company and enlisted as a pilot in training. After going AWOL, he traveled throughout Paracelos getting by on his charm, eclectic talents (including a mastery of machinery) and the occasional confidence trick. That’s when he ran into Evelyn Kelly. The time-frame of these adventures is muzzy at best. Lynald himself doesn’t know how old he is. HOW DID HE MEET KELLY? In the audience that evening was a Byronic figure, Mr. Evelyn Kelly, an avid opera-lover who was “celebrating” the termination of another one-sided relationship with a girl. He was looking forward to seeing his favorite opera singer, Madame Druhelian on stage for the first time. He was not disappointed. Madame was radiant, stunning, and showed amazing presence while attacking her songs with her angelic, regal voice. Kelly was entranced, falling under her spell as she sang. She’s singing to me, he thought foolishly. After the show, shocked at his own boldness, Kelly decided that he had to—he must—meet this astounding woman and tell her how wonderful he thought she was. He saw her in the grand foyer afterwards (which was oddly crowded by many men in uniforms for some reason). She was hiding demurely behind a fan and after a lot of anxiety and false starts, he managed to finally approach her. She tried to politely shoo him away, but Kelly knew his course and without reservation, snatched her fan away and blurted out, “I love you!” he was surprised to hear the good lady growl, “PISS OFF,” in a very mannish voice. Of course by then, the uniformed men were starting to swarm on the two of them, (Kelly is now guilty by association) so they started running and they’ve pretty much never stopped. Kelly’s regard towards Lynald shifted to a DRASTICALLY different branch of friendship, but he never stopped being in total awe of Lynald. *It’s pure coincidence that Lynald shared the same initials as Linus Weedwhacker. He’s actually not related to Linus at all, but he IS related (distantly) to both Bart Yenasfrin (On his mother’s side) of Must Love Dragons and Vilori Reagan (On his father’s side) of Runs in Good Condition. * His dragon Philomena, I named after Saint Philomena, a very minor Catholic saint who died a martyr and a virgin. *Lynald has never married, but he’s been engaged a few times. The first was a childhood sweetheart (a cousin) that he ran away from (more on that someday), there were some whirlwind romances that were cut short by fathers, rival suitors, or the good lady coming to her senses, and most recently there was Renata, who was a loony about preserving the Elven Race as Lynald’s parents. He’s also been engaged as a “kept man” (again, more on that later). 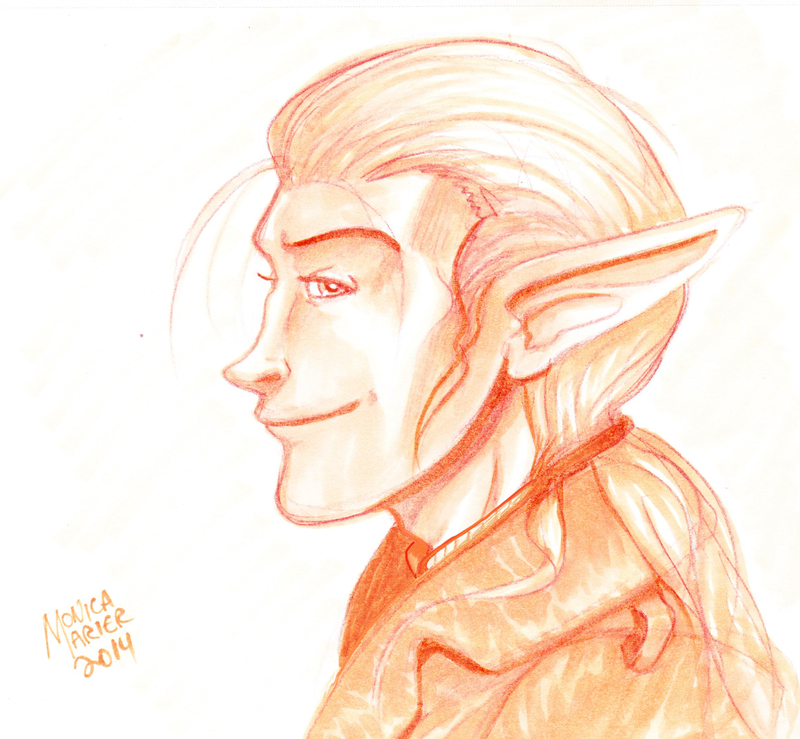 *Despite his icy relationship with his parents, he’s on good terms with his more distant relations, who actually pity him his nut-job parents and often offer to bring him into more “liberal” Elven society. *Lynald can fly Philomena without crashing but chooses not to for the sake of comedic narrative. Love the last bullet point!